“I QUATTRO RUSTEGHI is based upon the play, I RUSTEGHI, by the 18th-century Italian author Carlo Goldoni, adapted for the opera stage by Luigi Sugana and Giuseppe Pizzolato….The plot is rather standard opera buffa fare to be sure, but Wolf-Ferrari’s music elevates and perhaps even transcends the story. To be sure, the influence of prior great comic operas - most notably Verdi’s FALSTAFF, but also the works of such composers as Cimarosa, Mozart, and Donizetti - is evident. Like the best comedic achievements of his great predecessors, Wolf-Ferrari crafts an arrestingly deft score that enchants and captivates from start to finish. As in Verdi’s FALSTAFF, the orchestra plays a central musical and dramatic function, assuming the role of another principal character. Time and again, the orchestra comments upon and illuminates the action and the players (some of the Greek chorus interjections from the winds made me laugh out loud). There are also some ravishingly beautiful orchestral moments, such as the beguiling Intermezzo that concludes Act I. Again in the FALSTAFF tradition, Wolf-Ferrari proves himself an absolute master of comic ensemble writing, brilliantly combining voices to virtuoso musical effect, but always at the service of the drama. Wolf-Ferrari also takes tremendous care to assure that each and every word of the text is heard. Granted, to a great degree, that is also dependent upon the execution by the performers, and in this 1951 recording, taped in live performance, conductor Alfredo Simonetto maintains an ideal balance between stage and pit. I have never seen this opera in the theater, where I imagine its impact would be even greater. But the work succeeds entirely as a pure listening experience, and deserves far greater exposure than it has received to date. The Immortal Performances issue derives from a June 13, 1951 performance at the Teatro dell’Arte in Milan. The performance was recorded by the Italian Cetra-Soria label and issued on LP, later reissued by various labels….Immortal Performances returns to the Cetra-Soria source material. The voices and orchestra emerge with clarity, warm and attractive color, and in fine balance with the orchestra. Because of the nature of its writing, I QUATTRO RUSTEGHI (again, like FALSTAFF) demands an ensemble cast of the first rank. And that is precisely what the recording featured on the new Immortal Performances issue provides. There is not a weak link in the cast, with each vocalist relishing Wolf-Ferrari’s music and the text. And while each of the singers brims with personality, each is also mindful of his or her function as a member of the overall musical fabric, comprising both the voices and the orchestra. It’s wonderful to hear the great basso-buffo Fernando Corena in his youthful prime as Lunardo, already a master of comic effects, but couched in a voice of considerable richness and beauty. But all the principal singers hold their own. I already mentioned the marvelous balance conductor Alfredo Simonetto achieves between the singers and orchestra. His pacing of the work is also ideal, brimming with comic energy, but appropriately introspective and lyrical when demanded, as in the aforementioned orchestral Intermezzo. It is clear from reading Immortal Performances producer Richard Caniell’s various booklet essays that this opera and recording are a true labor of love. And Caniell has given this recording of an unjustly neglected work precisely the type of respect and treatment it deserves. In addition to first-rate sound restoration, the booklets include several in-depth essays on the opera, its composer, Goldoni, a discussion of Venetian dialect, the RAI series of recordings, artist bios, and notes on the recording. There is also a detailed plot synopsis, and access (via the Immortal Performances website) to the opera’s libretto (Venetian dialect and all) and an English translation. Sparkling performances by Arturo Toscanini and the NBC Symphony Orchestra of two Wolf-Ferrari opera overtures are the irresistible cherry atop this musical confection. “What a delight! 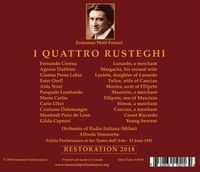 From beginning to end I QUATTRO RUSTEGHI is unalloyed pleasure. There are many reasons for its obscurity, but none of them have to do with the quality of the music. Probably the fact that the libretto is written in the Venetian dialect has not helped its acceptance, and even the title is difficult to translate….The story concerns a generational shift in attitudes about women. We have a crusty older group of Venetian merchants who believe that women belong under their thumbs, with no right to express opinions about anything. One of them is about to marry off his daughter Lucieta to a young man she has not met, and he won’t permit them to meet before the wedding. Other ladies, however, arrange a trick in which the youngsters do actually meet, and lo and behold, this being a comedy, they like each other. In the end the two do get married, although not without objections from the older generation of men who don’t like the fact that they were outfoxed…. Ermanno Wolf-Ferrari composed the opera in 1906, and it has enjoyed a life on the fringes of the repertoire in Italy and occasionally elsewhere. 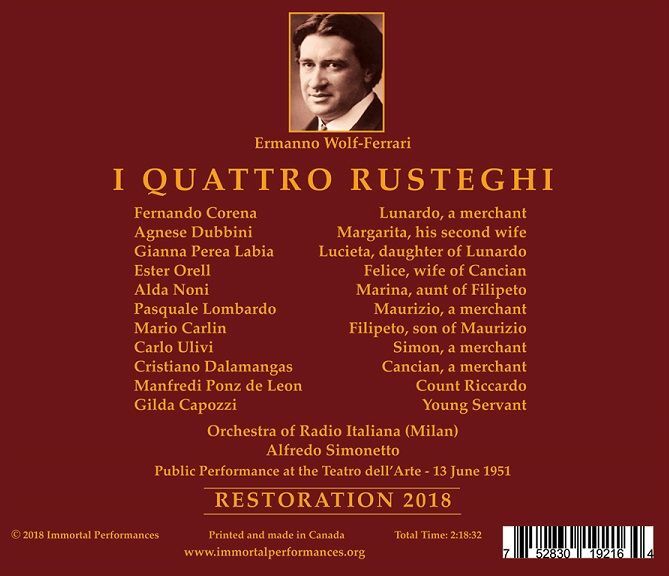 In fact the work merits greater exposure, and perhaps Immortal Performances’ brilliant reissue of a 1951 RAI broadcast, first released by Cetra, will bring it to the attention of opera producers. Although there have been other recordings, none has equaled the spirit and tight ensemble found in this one. The original Cetra LPs sounded splendid, but subsequent reissues attempted to ‘improve’ the sound and ended up muddying it up. Richard Caniell seeks to present a clean, straightforward replication of the original RAI sound and has done that with complete success. The key performer in this opera is not one of the singers but the conductor, who faces some complex challenges. Much of the opera is taken up by ensembles, duets, trios, quartets, even ensembles of six, seven, or more characters. The degree of interplay between the characters is what makes or breaks a performance, and it is not only the cast who has to produce that feeling but the orchestra as well. Wolf-Ferrari’s orchestral writing is brilliant and colorful, and it is fully integrated into the comedy. Instrumental soloists, winds in particular, have to echo (or presage) the phrasing and inflection of singers for the work to hang together, and they do so here. Tempo relationships and pacing are crucial, and Alfredo Simonetto seems to fully comprehend this. The big ensemble near the end of Act II with Filipeto, Lucieta, Felice, Marina, Margarita, and Riccardo has a wonderful ebb and flow, all of which stems from the conductor. This cast only contains a few names that will be familiar to most, Fernando Corena and Alda Noni being the two best known. While they do not disappoint, the lesser-known singers are their equal. Each contributes to the whole, which the profuse ensemble writing demands. The big Act II ensemble mentioned above could almost be one of Rossini’s masterpieces, except that the orchestration gives it away as something later. The opening of Act III is another miracle. Three of the rusteghi, Lunardo, Simon, and Cancian, are griping about the trick that was played on them by the women. They contemplate sending their wives to a nunnery but slowly realize that they would be lost without them. The musical interplay between the three men is magical. Felice enters and gives her husband (Cancian) his comeuppance before turning on his fellows as well. The musical commentary in the orchestra is ingenious, and the performance is picture perfect in its sense of timing. Mario Carlin, heard in secondary roles in many RAI broadcasts, does very well in the lead tenor part, holding his own against three important bass roles and one baritone. Among the women, in addition to the vocal shine we expect from Noni, Gianna Perea Labia proves a committed performer who knows how to impart meaning to every phrase. Mezzo-soprano Agnese Dubbini’s comic sense is perfect as Lunardo’s second wife, plotting to fool her boorish husband. As that boor, Corena sings with solid, resonant tone (he was in his prime at 34 in 1951) and a strong comic presence every time he opens his mouth. But the other lower voices, Pasquale Lombardo, Cristano Dalamangas, and Carlo Ulivi, yield very little to Corena in dramatic and musical impact. One thing that is striking about this performance (and the clarity of the recording) is the crispness of everyone’s diction. That is an art that has been diminished in value in today’s opera world, but it is essential to the success of a work like I QUATTRO RUSTEGHI. It is not a matter of our understanding the words (most of us won’t understand the Venetian dialect anyway). Rather it is that the clarity and crispness of the consonants give the music its shape and rhythmic spine, while also creating the sense of characters actually conversing with each other. 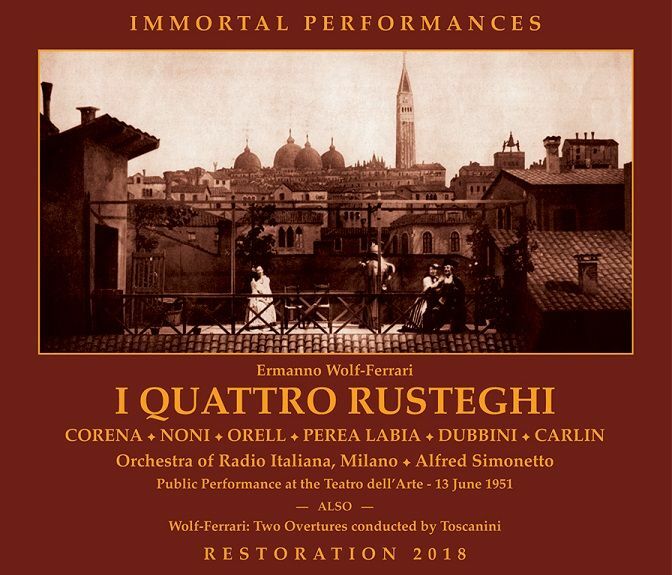 What especially distinguishes this performance from the other recordings of I QUATTRO RUSTEGHI that I have heard is the balance it finds between light comedy and farce. The four rusteghi must not become caricatures. In other recordings their boorishness is exaggerated, straining credulity. Goldoni wrote his play in 1760 (calling it more simply I RUSTEGHI). These men were upholding what was, to them, sacred tradition - the patriarch’s place as the head of the household. Goldoni was poking fun, and the story of wise women tricking old-generation males is the stuff of conventional 18th-century comic operas. But for it to convince, the men have to be believable, their negative traits seen in the context of a complete human being. Singers must convey their foibles without overplaying the buffoonery, which is precisely the balance that our four ‘grumpy old men’ (I am still grappling to come up with a better translation) present here. They manage to be funny without ever seeming ridiculous. Immortal Performances, in its typically lavish booklet, provides a detailed plot synopsis keyed to the track listing, a wonderful essay by Caniell about the opera, and another on the recording itself. There are also biographies of the composer, playwright, and artists, and a delightful collection of historic photos of paintings to represent different characters in the opera. We even get an insightful piece about the Venetian dialect. To access the full libretto with translation, Immortal Performances provides a link to its website, and I recommend taking advantage of that. One can certainly get much out of the opera by following the synopsis, but the musical interplay is so closely related to the text that one derives even more pleasure with the libretto in hand. “Ermanno Wolf-Ferrari, an important Italian composer of the late nineteenth and early twentieth centuries, was born in Venice on January 12, 1876, to a Bavarian father and an Italian mother. He showed unusual talent on the piano in his childhood, but gradually felt drawn toward painting, the art world of his father. He enrolled at the Academia di Belle Arti when he was 15 and two years later relocated to Munich to pursue further art instruction. In 1895, the young composer, previously known Ermanno Wolf, became Ermanno Wolf-Ferrari, attaching his mother's maiden name to the family surname. Apparently, he desired renewed connection to the Italian side of his heritage. His 1901 cantata La vita nuova was greeted enthusiastically. Wolf-Ferrari's next operas met with general acceptance as well; LE DONNE CURIOSE (1903), I QUATTRO RUSTEGHI (1906), AND IL SEGRETO DI SUSANNA (1909), all comedies, were staged in Munich. The latter two became quite popular on the world's operatic stages for a time. During this period Wolf-Ferrari served in his native Venice as director of the Liceo Musicale.